Construction of instruments with this capability is now possible because of a fundamental advance in the quality of an optical material used in hyperlensing, a method of creating lenses that can resolve objects much smaller than the wavelength of light. The achievement was reported by a team of researchers led by Joshua Caldwell, associate professor of mechanical engineering at Vanderbilt University, in a paper published Dec. 11 in the journal Nature Materials. The researchers achieved this enhancement by making hBN crystals using isotopically purified boron. Natural boron contains two isotopes that differ in weight by about 10 percent, a combination that significantly degrades the crystal's optical properties in the infrared. "We have demonstrated that the inherent efficiency limitations of hyperlenses can be overcome through isotopic engineering," said team member Alexander Giles, research physicist at the the U.S. Naval Research Laboratory. "Controlling and manipulating light at nanoscale dimensions is notoriously difficult and inefficient. Our work provides a new path forward for the next generation of materials and devices." The primary reason for developing hyperlenses is the prospect that they can provide such highly detailed images of living cells in their natural environments using low-energy light that does not harm them. In addition, using infrared light to perform the imaging can also provide spectroscopic information about the objects it images, providing a means to 'fingerprint' the material. These capabilities could have a significant impact on biological and medical science. 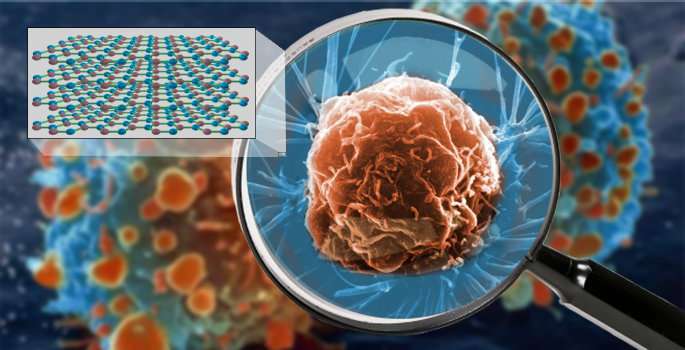 The technology also has potential applications in communications and nanoscale optical components. The physics of hyperlenses is quite complex. The level of detail that optical microscopes can image is limited by the wavelength of light and the index of refraction of the lens material. When combined with the factors of lens aperture, distance from the object to the lens and the refractive index of the object under observation, this translates to a typical optical limit of about one half the wavelength used for imaging. At the infrared wavelengths used in this experiment, this "diffraction limit" is about 3,250 nanometers. This limit can be surpassed by using hBN due to its ability to support surface phonon polaritons, hybrid particles made up of photons of light coupling with vibrating, charged atoms in a crystal that have wavelengths much shorter than the incident light. In the past, the problem with using polaritons in this fashion has been the rapidity with which they dissipate. By using hBN crystals made from 99 percent isotopically pure boron, the researchers have measured a dramatic reduction in optical losses compared to natural crystals, increasing the polariton's lifetime three-fold, which allows them to travel triple the distance. This improvement translates into a significant improvement in imaging resolution. The researchers' theoretical analysis suggests that another factor of ten improvement is possible. "Currently, we have been testing very small flakes of purified hBN," said Caldwell. "We think that we will see even further improvements with larger crystals." In 1654 Anton van Leeuwenhoek used one of the first handcrafted microscopes to discover the previously unknown world of microscopic life. This latest advance in hyperlens development is a significant step toward taking van Leeuwenhoek's discovery to a whole new level, one which will allow biologists to directly observe cellular processes in action, like viruses invading cells or immune cells attacking foreign invaders. This could really benefit the scientists looking for cures and new antibiotics. "Every layer of reality revealed gives new answers but always comes with more questions." Who knows what we'll find in the abyss, but it'll be interesting.